With the first home game of the 2017 season only a week away, the stately oaks of LSU’s campus are soon to be shading more than just inspiring halls as tiger fans prepare their tents and RVs for the start of Louisiana’s tastiest tradition, Tiger tailgating. 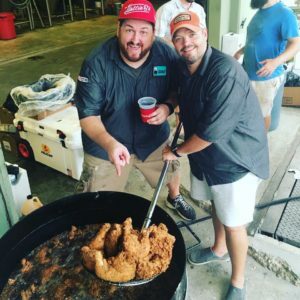 As an LSU alum, reigning tailgate champion and local chef turned celebrity Jay Ducote is something of an expert on football festivities. However, according to Ducote, you don’t have to be a seasoned pro to create the best tailgate on the Parade Grounds. 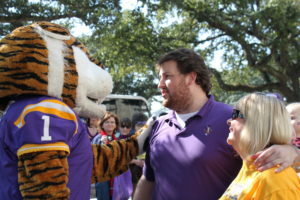 Ducote says that since tradition lies at the heart of LSU culture, pick a Louisiana favorite dish, such as gumbo or jambalaya, to whip up while the party is going. Or, if you are feeling adventurous, Jay suggests you give your guests a true taste of Tiger bait by cooking up the opponent’s mascot for special rivalries such as Florida and Arkansas. Fried gator and roasted pig are crowd pleasers that are sure to get everyone ready for victory. No party is complete (or really even started) without some specialty drinks, and according to Jay, “If you aren’t tailgating with craft beer from Louisiana, you’re not doing it right.” With tons of new local brews, skip the same old beer and treat yourself and your guests to beverages made for Tiger fans, by Tiger fans. Get a special taste with Jay and his Gov’t Taco team tonight, Thursday, Aug. 31, at Tin Roof Brewing Company with the release of Tin Roof’s new iteration of Gameday IPA. The event will feature tacos and other tailgate fun while supporting the relief effort in Houston, with 20% of all sales going to Operation BBQ Relief to help feed those affected as well as the first responders. While the small details enhance the atmosphere, for Jay, the food and drinks come only as a reflection of the greater experience that occurs in the midst of the broad magnolias of LSU’s campus. The culture and camaraderie of football fans from Baton Rouge and beyond are the reason that Louisiana hosts the best tailgates in the entire SEC. For more information on Jay and the Bite and Booze team, visit biteandbooze.com.